Patients with obstructive sleep apnea (OSA) commonly report residual excessive daytime sleepiness (EDS) despite treatment with positive airway pressure (PAP). The present study aimed to determine whether patients presenting with subjective sleepiness after treatment with PAP therapy had objective evidence of residual sleepiness. We conducted a retrospective analysis of 29 adults with OSA on PAP therapy who underwent a standardized evaluation for EDS. Patients were evaluated with the Epworth Sleepiness Scale (ESS) and attend an in-lab polysomnogram (PSG) with PAP followed by a multiple sleep latency test (MSLT). Our cohort consisted of 23 men (79%) and 6 women (21%) with a mean age of 40.7 years. All patients were subjectively sleepy with an ESS score of > 10 and met minimal PAP usage of 4 h a night for at least 70% of nights with a residual apnea-hypopnea index (AHI) ≤ 10. On MSLT, 31% of patients had an average sleep onset latency (SOL) < 8 min, 35% had a SOL between 8 and 11 min, and 35% had SOL > 11 min. After optimizing PAP therapy and sleep in patients with OSA and residual EDS, the majority were found to have objective findings of an abnormally short SOL on MSLT. 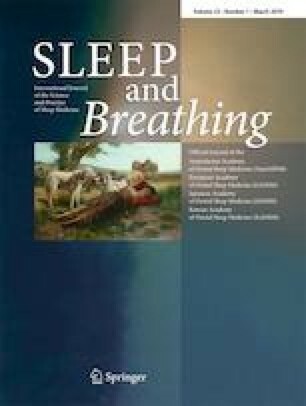 This is further evidence that there is a distinct OSA phenotype that will have persistent EDS despite appropriate treatment of their sleep-disordered breathing. Objective testing to quantify the degree of sleepiness is recommended for OSA patients with residual EDS. All procedures performed in this study as it pertains to the utilization of personally identifiable information (involving human participants) were in accordance with the ethical standards of the San Antonio Military Health Systems Institutional Review Board and with the 1964 Helsinki Declaration and its later amendments or comparable ethical standards. The authors declare that they have not conflict of interest. All work was performed at the Wilford Hall Ambulatory Surgical Center, JBSA Lackland, TX 78236. The opinions and assertions in this manuscript are those of the authors and do not represent those of the Department of the Air Force, Department of the Army, Department of Defense, or the U.S. government.